Easy Pass 는 패스워드 입력, 관리, 생성을 할 수 있는 앱입니다. 자주 사용하는 비밀번호, 이메일, 웹 주소, 또는 암호 등을 입력해 놓았다가 클릭 한번에 복사한 다음 입력란에 바로 붙여 넣을 수 있습니다. 복사한 후 입력란을 길게 터치하면 붙여넣기 메뉴가 나옵니다. 각 패스워드 옆에 체크박스를 클릭하면 시스템 트레이에 아이콘이 등록되어 더욱 편리하게 이용할 수 있습니다. 문자등을 보실때 위에서 끌어내리는 목록에 등록이 됩니다. 입력시 위에서 끌어내려서 한번 클릭만 하시면 됩니다. 중요한 비밀번호는 다시 패스워드를 걸어서 보호할 수도 있습니다. 모든 비밀번호는 암호화되어 안전하게 보관됩니다. 안드로이드 폰에서는 마켓링크를 누르시면 바로 검색됩니다. 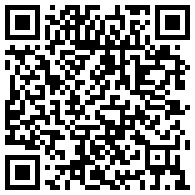 옆옆 QRCode 를 안드로이드 QRCode 어플을 이용, 카메라로 찍으시면 바로 검색됩니다. Easy Pass is a very convenient password input assistant, manager, and generator. You can register frequently used passwords, email address or another words on the notification list. Short click on list item will copy it on the clipboard and close the app. Long click shows context menu leading to edit or delete each password. Checked passwords are registered on the notification list. Uncheck after check will unregister password. Whenever you need to input a long word just drag down notification list and touch words registered. Then immediately that word is copied to clipboard so that you can paste it right away. You can change default icons with the one in your gallery by clicking "Choose from gallery" and selecting pictures. Then icons in list and notification list will be changed. 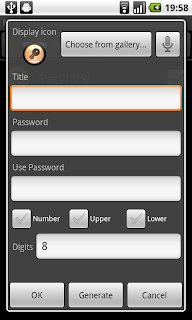 With icon on the upper right corner, you can input title or passwords with voice recognition. There is also use password protection for really important passwords in that case you can't register that password on the notification list and you need to enter use password everytime you edit it or copy it to the clipboard. Use password is requested when you are about to edit or copy the password. 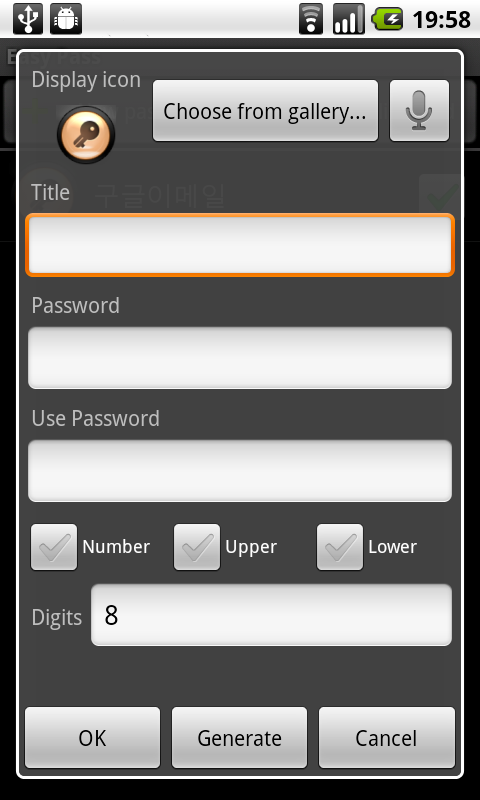 You can generate random password by selecting digit and kind of characters and pressing generate button. Every passwords are encrypted and stored to protect from fraud.